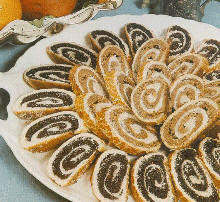 Beigli is the most popular Hungarian Xmas cake, which is a traditional holiday roll filled with poppy seeds or walnut. Kossuth kenyér, sponge cake baked with walnut, cinnamon and cocoa. As you can see, mostly the poppy seed and walnut play the main role in our traditional Xmas cakes. I promise that I'm going to share with you my Xmas cake recipes, too. Could you post the recipe (or email to me) for beigli? My best friends are from Hungary, and I'd love to make this for them for Christmas! Please, could you share the recipe for this Kossuth kifli, looks great!!! Thank you and Happy Chrismas and a great New Year! Would you be willing to post the recipe for the Poppy Seed Flan? It looks as if you used cookie cutters to create the shops. Looks delicious! !